Keeping the homestead together in Liberty Township. 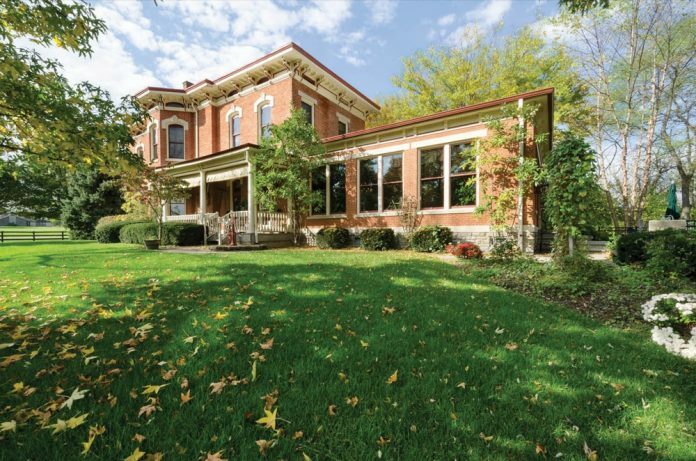 In 1875, Mary Frances and James Elliot paid $3,000 to build a solid brick house in Liberty Township. Three years later, for an extra $1,800, they added the adjacent stone-and-beam barn to a 150-acre plot of land their family had owned since just after the Civil War. They named the place Stony Run Farm. The property was still a working farm when Gayle and Otto Keeton bought it in 1990, from the Elliots’ descendants. The Keetons wanted to save the farm from being subdivided by a developer. Which is kind of ironic, since they sold the property last fall to M/I Homes. Thankfully, this story has a happy ending. M/I’s usual m.o. is: Buy the land, raze the original house, and start a new community from the ground up. But this time, M/I decided to try something different, says Dan Tartabini, VP of sales and marketing. Here, M/I decided to spare not only the original house, but the eight-acre parcel immediately surrounding it. So, although the streets will be poured soon for Turnbridge—a development of 139 homes that will cover the farm’s remaining 142 acres—the Elliots’ original home and barn will rest in peace on a sizable plot of land. But buyers will have to come up with more than $4,800 to own it: It’s listed for $799,990. The Keetons really couldn’t stipulate that the house needed to stay, but the extensive renovations they’d done probably made it a no-brainer for M/I (which, the couple says, “has been wonderful to work with”). Between 1990 and 2014, the Keetons did everything from re-wire to re-plumb, installed an in-ground pool with poolhouse, and pretty much re-built the barn from the ground up. The couple now enjoys living in a smaller, newer home which affords them plenty of opportunity for travel (they’ve got grandkids in Michigan). Even so, they’ll miss the square dances they hosted in the barn every year. “Basically, we liked the house and wanted to fix it up if we could,” says Otto. It’s safe to say that he and Gayle surpassed that goal.